Inter have reportedly agreed terms on a contract renewal with Milan Skriniar, dealing a transfer blow to Man City and Real Madrid. The 24-year-old has established himself as a key figure for the Nerazzurri since joining them in 2017, making 40 appearances in his debut campaign last year and helped guide the club back into the Champions League. Coach Luciano Spalletti has relied heavily on him again this year with Inter battling for a top-four finish in Serie A once again, and so clearly they will be desperate to keep hold of him. As noted by Calciomercato last week, it had been suggested that Man City were ready to offer €100m for the Slovakian international this summer as Pep Guardiola seemingly eyes defensive reinforcements to further strengthen his squad. Real Madrid are specifically mentioned as another interested party, and so it appears as though Inter could face severe difficulty in trying to keep Skriniar in Milan. However, it’s now been suggested by Calciomercato in their latest report that Skriniar has in fact signed a contract renewal which will keep him at the San Siro until 2023, with his salary being doubled. If that is indeed the case, that will be a major blow for both City and Real Madrid as that would surely rule out the chances of an exit at the end of the season. 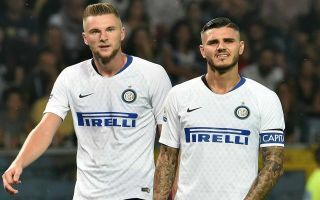 In contrast, it could merely be an exercise to strengthen Inter’s position in negotiations, as they could certainly now demand a mammoth fee, as suggested in the previous report. Regardless though, if the Italian giants wish to make progress and try to topple Juventus for the Serie A title, they will surely have to start keeping their best players at the club.